The Natural Park of Sitia is on the easternmost edge of Crete, in the Municipality of Sitia. It covers the entire area of the former Kapodistrian Municipality of Itanos, as well as parts of the former Municipalities of Lefki and Sitia. Geographically, it extends from cape Kavo Sidero, in the north, to the southern coast of the Municipality, the edges of the city of Sitia, to the west, and the coast of Zakros, to the east. It is mainly a mountainous area, with the Zakros Mountains dominating the landscape and the lace-like coastline all along the shores. Park’s boundary have been assigned in detail covering an area of 361,4 km2 (or 361,4 hectares). Eastern Crete, and especially the area of Sitia, is one of the most important and environmentally unique areas of Crete. Its geographical position on the eastern edge of the island, which allowed for the exchange of species with Asia Minor, in combination with the intense dry and hot climate of the area, created a mosaic of habitats and ecosystems, some of which, such as the Palm Forest of Vai, are unique in the Mediterranean. The prevailing ecosystem in the area is mainly brush, i.e. low vegetation that mostly consists of brushwood, aromatic herbs and invertebrates, reptiles and mammals that live in such habitats. There are no large forest ecosystems or clusters of trees in the area, except in the Palm Forest of Vai, where the Cretan Date Palm (Phoenix theophrasti) prevails, and small patches of Kermes Oak (Quercus coccifera), Oriental Planes (Platanus orientalis) and carob trees (Ceratonia siliqua), usually found in canyons and ravines. The habitats observed in the area, which have been recorded in the NATURA 2000 network, are patches of Phoenician Juniper (Juniperus prhoenicea) on coastal sand dunes, such as the areas of Chryssi Ammos in Vai and Katsounaki beach in Xerokambos, and brush vegetation that dominate the entire park, Mediterannean ecosystems with a steppe-like mountainous grasses, rocky habitats on steep mountainsides and canyons, Mediterranean rivers with periodic flow, clusters of Cretan Date Palms, wetland systems and small Mediterranean lakes that periodically flood with waters, and, lastly, agricultural land as well as crop fields, mainly vineyards and olive groves. 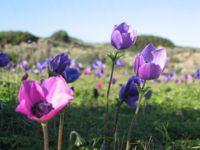 Sitia Natural Park presents great floral interest. Amongst the hundreds of plant species it hosts, there are many endemic species encountered throughout Crete, endemic to Crete and Kasos, as well as unique species, known only to the southeast Aegean. The region as a whole belongs to the Mediterranean Vegetation Zone, where brush vegetation prevails. Variations in the vegetation are small, with some exceptions in areas such as the Vai Palm Forest and the surrounding area, as well as in some canyons with an intense presence of water, at least during winter months (Zakros canyon, Xerokambos, Chochlakia). The existence of great expanses of olive trees, vineyards and other tree crops is also very important for the composition of the island’s flora.The brush that covers many parts of the park, both coastally and in the mountain area, are dominated by low, thorny and spherical bushes, such as the Thorny Burnet (Sarcopoterium spinosum), Thyme (Coridothymus capitatus), Broom (Genista acanthoclada), Winter Savuory (Satureja thymbra) and Greek Spiny Spurge (Euphorbia acanthothamnos). They coexist with non-thorny bushes such as Heather (Erica manipuliflora), Ballota acetabulosa, Greek Sage (Salvia fruticosa) and the Rock Rose (Cistus creticus, Cistus salviifolius). On smaller expanses of land, taller bushes are encountered, forming maquis vegetation and consisting of Mastic (Pistacia lentiscus), Spiny Broom (Calicotome villosa), Wild Olives (Olea europaea subsp. Oleaster), Phoenician Juniper (Juniperus phoenicea), Kermes Oak (Quercus coccifera), Carob trees (Ceratonia siliqua), Osyris alba, oleander (Phlomis fruticosa) and Tree Spurge (Euphorbia dendroides). 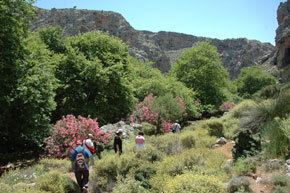 Other plants that grow in the ravines in the area of Zakros, where there is plenty of water, are Oriental Planes (Platanus orientalis), Oleander (Nerium oleander) and Vitex (Vitex agnus castus). The region’s canyons offer refuge to many important species of flora in the area. The canyons of Kato Zakros and Chochlakia, in particular, are home to a large number of plants and they attract many researchers and observers every year. Characteristic species that have found a home on the sheer limestone rocks and on the ravine beds are Αristolochia cretica, Delphinium staphisagria, Wild Carnations (Dianthus juniperinus), Εuphorbia dendroides, the Lecokia cretica, Εphedra cambylopoda, Nepeta melissifolia , Capers (Capparis spinosa), the Dracunculus vulgaris, bluebells (Campanula pelviformis and Campanula spatulata ssp. Filicaulis), Jerusalem Sage (Phlomis lanata), Oregano (Origanum onites), Tulipa saxatilis and many orchid species.Coastal areas are dominated exclusively by herbaceous plants, mainly Amaranth (Limonium greacum) and the endemic Limonium sitiacum, while on the beaches of Katsounaki and Argilos in Xerokambos, there are Sea Daffodil (Pancratium maritimum). The territory of Sitia, due to its unique geographic location, is home to a large number of characteristic animals of the island, especially migratory birds. Twenty of the bird species that have been sighted in the area (migratory, indigenous) are in the Red Data Book of Threatened Vertebrates of Greece.Birds visitors can observe in coastal areas are the Little Egret (Egretta garzetta), Cory’s Shearwater (Colonectris diomedea), the European Shag (Phalacrocorax aristotelis), (the European Storm Petrel), the Western Marsh Harrier (Circus aeruginosus), Audouin’s Gull (Larus audiouinii) and the Woodchat Shrike (Lanius sanator sanator). Of the predatory and scavenger birds, the most characteristic are Eleonora’s Falcon (Falco eleonorae), the Golden Eagle (Aquila chrysaetos), the Peregrine Falcon (Falco peregrinus), the Common Buzzard (Buteo buteo), the Lesser Kestrel (Falco naumanni), the Griffon Vulture (Gyps fulvus) and the Bearded Vulture (Gypaetus barbatus). The Bearded Vulture occasionally makes an appearance in the area and it is one of the most important species on the island as the Cretan population is the only reproducing population in all the Balkans. As far as mammals are concerned, 14 species have been recorded in the Park area, four of which are cetaceans, like the strictly protected Bottlenose Dolphin (Tursiops truncatus), and the Mediterranean Monk Seal (Monachus monachus), the Striped Dolphin (Stenella coruleoalba) and the Common Dolphin (Delphinus delphis). Of the land mammals the most characteristic is the European Hare, the Least Weasel, the Beech Marten, the European Badger, and the Spiny Mouse, while in caves there are Pipistrellus savii bats, a strictly protected species. Many of the eight species of reptiles and two of the three species of amphibians of the region are included in Directive 92/43 EEC and the Berne Convention. In this area all three species of amphibians found in Crete may be encountered, namely the European Green Toad (Bufo viridis), the Common Tree Frog (Hyla arborea cretensis), an indigenous species to Crete and the only species of tree frog in Europe, and the Marsh Frog (Rama ridibunda). One of the most important reptiles of the area is the Caspian Turtle (Mauremis caspica), the only species of water turtle on Crete that can be observed in streams in the palm forest of Vai, in the canyon at Toplou Monastery and, mainly, in Kato Zakros. Furthermore, the Caretta caretta sea turtle breeds on the sandy beaches of the Vai palm forest, in Kouremenos and in Xerokambos. Very important to the area are the Podarcis cretensis lizards, which are the only indigenous lizard species on the island, and the Ocellated Skink (Chalcides ocellatus), which is found in Italy, Greece and North Africa, and which is mistakenly considered poisonous on Crete. Of the snakes in the area none are dangerous to humans. The Balkan Whip Snake (Coluber gemonensis) and the European Rat Snake (Elaphe situla), the most beautiful snake in Greece, are completely harmless to humans, while the European Cat Snake is the only snake on the island with venom, which, however, is very weak and secreted from its back teeth, a fact that renders it virtually harmless. As far as endemic species are concerned, two endangered types of Silenus spread in the area. The sandy beaches of Kouremenos are home to populations of the endemic subspecies of eastern Crete Silene ammophila subsp. ammophila, while the islet in the cove of Vai is the southernmost point where Silene Holzmannii, endemic to the southeastern Aegean, has spread to. Cape Kavo Sidero is also home to two closely related endemic species: Anthemis filicaulis and Asperula crassula, the world population of which is limited only to this specific cape! Bellevalia sitiaca is also endemic to the eastern part of the prefecture of Lasithi and it grows on rocky positions at low altitudes, while shoreline rocks are home to two more endemic species of Kasos and the northeastern edge of Crete: Limonium sitiacum and Carlina sitiensis. Other species that are also important to the area are Viola scorpiuroides and Allium longanum, two African species, particularly important for Europe, since their growth has been limited to Crete and Kythera, as well as Centaurea aegiolophila, a species of the Eastern Mediterranean, also very significant for Europe, because its areas of growth are only limited to NE Crete, mainly along the coastal zone of Plakopoules and Chiona. The Cretan Date Palm (Phoenix theophrasti) is characterized as vulnerable in the IUCN Red List and it is protected by Greek legislation. Subpopulations are now growing in very few areas of Crete, the most important and multitudinous of which is that of Vai, where it has formed the renowned Palm Forest.Other important endemic species of flora that can be encountered in the area are Campanula creutzburgii, Cirsium creticum , Crepis cretica, Cyclamen creticum, Galium graecum, Nepeta melissifolia, Petromarula pinnata, Symphytum creticum, Tulipa cretica. On vertical rock faces in the area one may also encounter perennial chasmophytes, such as Origanum calcaratum, endemic to the southeastern Aegean, which only grows in Crete between the villages of Roussa Ekklisia and Kryoneri, Thymbra calostachya, which is exclusively endemic to the province of Sitia, and Cretan Ebony (Ebenos creticum), endemic to Crete. The limestone rocks are also dominated by Wild Carnations (Dianthus juniperinus) and Capers (Capparis spinosa). All terrain features within a territory, namely rocks, ores and fossils, as well as the physical processes affecting them comprise the local geodiversity. Major features, i.e. those most significant among them, are called geotopes and, as a whole, they comprise the region’s geological heritage. Sitia Nature Park hosts an impressive geological heritage that includes impressive rocks, from the majority of the tectonic units of Crete, peculiar landforms and landscape features, tectonic structures, and many fossils. More than 100 geotopes, have been identified within the area of the Park, and are presented on the various maps of the Park, awaiting you to discover them. Two areas of the Sitia province are integrated to the "NATURA 2000" network (EU guide 92/43/ AIE), which are of great interest, in terms of natural environment. A beautiful sandy beach surrounded by the palm tree forest, situated in a valley next to the ancient city of of Itanos. It is 28 km away from Sitia, 8 km from Palekastro and 6km from the monastery "Toplou"It covers 200 hectares and it consists of agrestal Phoenix Theofrasti palm trees. It is a unique in size forest, not only in Greece but also in Europe. Except in the beach of Vai, this type of palm tree is also found in units or clusters in other parts of Crete (Preveli, Aghios Nikitas, ect), in other islands of the north-east Aegean, in Cyprus and Turkey. There are many legends around the origin of the palm tree forest. It is said that it was created by the Phoenicians who, according to a theory, first inhabited the area of Itanos. According to other legends, the palm tree was created by the seeds of dates consumed by the Epyptian soldiers of Ptolemeos or of the King of Pontus, Mithridatis, who in the framework of alliances had settled in the area, or by Saracen pirates. Whatever the cause of its creation, the sure thing is that the palm tree forest of Vai is preserved by the dry and warm climate, as well as the underground water of the valley. Palm trees existed in Crete since antiquity, according to the testimonies of Theofrastos and Plinios and considering their representation on coins and vessels. Clusters of palm trees are also found at the beach of Itanos. Apart from palm trees, other kinds of African vegetation grow in the area, making it a place of unique biodiversity. The area is also a passage of migrating birds. The landscape is adorned with the pale lines on the horizon, the harmonious interchange of hills and lowlands, the vineyards and the olive plantations, the exotic colors and the dazzling light, while the existence of ancient cities and the "Toplou" monastery assign a unique historical and cultural importance to the region. Due to its unique value and beauty, Vai is protected by the Greek state, the European community and by international conventions. The region is located on the southeast part of Crete, about 35km east from Ierapetra. There is a small gorge -3km long- which has the same name as the monastery (Kapsas), located within the gorge. At the exit of the gorge, towards the sea, there is a small sandy beach with sand dunes. The area has a variety of rock formations and rocky hills. There are also shrubs in very good condition. The sea covers less than 1% of the total area. The kinds of biotope found in the area are: rocky coastlines with Mediterranean vegetation (endemic limonium spp.). Streams of the Mediterranean with periodic water flow, Sacropoterium spinosum shrubs, screes of the Balkan Peninsula, limestone rocks of the Aegean, inaccessible caves, riparian vegetation- drifts of the warm Mediterranean (Nerio -Tamarketea).In general, the region is of a great aesthetic value. It also presents an interesting diverse flora (it includes 14 endemic and local endemic species, some of which are rare), due to its geomorphology. This region is located between Ierapetra and Sitia. It includes the coastline of Tholos and the mountain chain of Thripis. The gorge of "Ha" is one of the most impressive gorges in Crete. The humid ponds are characterized by limited vegetation of annual plants, which are common in other places but rare in Crete, while the dry ponds are characterized by thick vegetation. Equally important are the dolomites near the mountain top "Afentis" and the limestone in the wider region. In the south part of the area, there are small prairies with water springs and rivers of constant flow with waterfowl vegetation. The kinds of biotope in the area are: Rivers of the Mediterranean with periodic flow, scattered degraded scrublands (garrigues), Sacropoterium spinosum shrubs, Cretan formations (Euphorbieto-Verbascion), sclerophyllous forests used for pasturage (dehesas) with Quercus ilex, screes of the Balkan Peninsula, limestone rock formations of the Aegean, primordial meadows on rock surfaces, protected caves, plane tree forests of the East (Phtanion orientalis), Riparian forests - drifts of the warm Mediterranean (Nerio -Tamarketea), Mediterranean pine forests with endemic species of Mediterranean pine. The area is of great aesthetic value, especially its northern parts. The cave "Theriospilios" is especially important as there are numerous endemic invertebrates and is a relatively large habitat of "myotis myotis" bats. The tops of the mountain chain are very important for the avifauna of Crete. It has one of the richest floras of common and endemic species in the region and in Crete. Its fauna is also rich in endemic invertebrates. The population of mammals in the region is in very good condition.Finally, there is a variety of well-preserved kinds of biotope, which are not easily accessible. The pine forest of the region is one of the most important in Crete, despite the disasters from bush fires. This region includes the Northeast side of Crete, the Peninsula of Sidero and the nearby islands, Dionysades and Elasa. The vegetation mainly consists of shrubs, while in the prairies degraded maquis are preserved. The only palm tree forest in Europe with Phoenix theophrasti is located in Vai. There are water streams that dry up during the summer, riverain vegetation and many aquatic invertebrates. There are 2-3 villages in the whole area. The areas around the villages are cultivated, while there are greenhouses with banana trees. In the east coast, facing the palm tree forest, there are sand dunes. In the west coast, there are "Posidonia" prairies. In the same area, groups of dolphins (Tursiops truncatus) have been spotted. In the end of the Peninsula there is a military base. The islands of Dionysades and Elasa are deserted. The vegetation on these islands is shrubs, while near the sea there are halophyllous plants. The wider region presents a unique flaura and fauna, on the land and in the sea environment. The palm tree forest of Vai is a unique and especially important biotope and has been characterized as the "Aesthetic Forest". The Cretan endemic plants in the region of Sitia usually grow in high altitudes, in gorges and isolated areas. Some of these plants are extremely rare or in danger of extinction. Most of the endemic plants grow in rock cracks and steep cliffs, where humans and animals cannot reach them. Its shoot is median, fuzzy, with medium and basal oblongovate leafs and dichotomous stem. The calyx lobes are twice the size of the ovary, and it has tubelike corolla of blue-violet color. It blooms in April-May and grows on rocks and gorges in high and low altitudes. It is the only endemic cyclamen species in Crete. It has tuber at its root, and the leafs are long-petioled, more or less cordate at base. Its white (and sometimes rosy) flowers bloom in March-April. It grows on montane and sub-montane zones, in shady locations. A biennial plant with a rosette of pinnatelylobed or pinnate leafs, up to 30cm. High and hairless stems, up to 80cm. Flowers blue that bloom from April to May. It grows on rocks and gorges from sealevel to the montane zone. It is an endemic plant of Crete and grows on rocky areas, usually in an altitude of 100 to 1800 meters. It has pubescent or hairy leafs, slender quandrangular reddish stems, and purple corolla. It is boiled in water and used as hot medicinal drink. In eastern Crete it is also known by the name "Antonaida". Small endemic shrub of Crete that grows all over the island, on dry, rocky slopes of hills and gorges in the montane and lowland zones. It has impressive reddish flowers in dense hairy racemes that bloom in April.